Star Student of the Month. We love Bright Minds :) Teach our children about the world. Love our children like their own. Teach our children life lessons. Thank-you for taking great care of my treasure by nurturing her so that she can be a successful little individual. I am writing all of this for two reasons: First I would like to just express my gratitude for all that BMIA has done for our family. I am so grateful for how attentive you all were to Paris and how Mrs. Debbie connected with Paris over the years. I am confident that Paris was constantly learning and growing at Bright Minds, so I just wanted to take the time to say thank you for all that you’ve done and continue to do. Please send my love and thanks to Mrs. Debbie as well!. In addition, Paris is always asking about Bright Minds, Mrs. Debbie, and the friends she’s made there (Jaylen, Julian, Latani, just to name a few!). In fact, just this morning, she asked if I could bring her back to say hello. If there is ever a birthday party in Mrs. Debbie’s class, or an event at school, please let me know. I would truly go out of my way to bring Paris to interact with her friends that she misses dearly. Additionally, if she could still attend movie nights, I would be willing to pay to bring her just for the opportunity to see her happy. I am getting emotional writing this, so I am going to stop now. Paris and I miss you all every day! Please keep in touch with us and let me know of any opportunities to bring Paris to see her old friends again. Wonderful atmosphere! The curriculum is amazing and he's learning so much. He truly amazes me and I can't thank your staff enough. His teachers are awesome and communicate his progress often. They are accessible daily with a friendly smile and warm heart. I can say the same about administration! They are always attentive to my questions or concerns. I love this school and all of the people! Our daughter's 2nd home. I do not have any words to express my feelings about the whole stuff at Bright Minds Academy International in Tamarac. They are beyond Awesome, Loving, Caring, Pleasant, Comfortable. Since i met this team i say my two kids have another family. They are doing an excellent job. Go Bright Minds !. Keep it up!. Thanks. At the beginning of February 2016, my granddaugther and I walked into your school looking for a place to spend a few hours a day socializing with other children, she was very fearful of new people and places due to the many changes going on with her family. The uncertainties and separation anxieties were to say the least very painful for all of us. I have no way to put into words our gratitude to you and your staff for the care, acceptance and love you have given to our precious Marie. During these months it has been a joy coming in and being greeted by Ms. Abby's always pleasant smile, Ms. Alicia, her guardian angel, who always came to the rescue, with patience and love, during the most difficult times and reassusred me she would be alright. Above all, it's been an honor and a priviledge to get to know the level of professionalism her classroom teachers, Ms. Nayrim and Ms. Dury provide. These two ladies have created a perfect environment of patience, nurture, support, harmony and love in the classroom; have gone above and beyong their call of duties and because of that my granddaugther is now a confidant, vibrant 4-year-old who loves her friends and teachers, has a thirst for knowledge and finds joy and interest in all things new. As you can see there are no words express how we feel therefore will just say; THANK YOU! Thank you from the bottom of our hearts. We wish you and Bright Minds Academy continued success in the honorable work you do. All of out love always. I'm in love with this school!! When I drop my son off, I feel like I am leaving him with family and not just at a place if business. The curriculum is amazing and I couldn't have asked for better teachers. The only thing is often times when I pick my child upp their pamper hasn't been changed. That's my only complaint.. Wonderful staff and very friendly environment, I know my son is always safe and loved at BMIA. I feel blessed having my two kids be part of the Bright Mind Academy family. The whole crew is wonderful. Their love, their care are so awesome. I could not say or fing something wrong and they are very disciplined which is i love that. Keep up the great work !!!. I do not regret not one thing having my two kids be part of the Bright Mind Academy family. Ms Ana and Ms Avi with their whole crew are awesome. Their love, their care and they are very disciplined. Keep up the great work !!! Above expectations. Lovely environment. Great experiences for life. The best teahers!!! It's our daughter's 2nd home!!! We just love all the teachers at Bright Minds! My daughters teachers are amazing. They are so loving and make school wonderful for her. We love the school, can you open one in the Wellington area? If my son wants to go every day and when i pick him up he is happy...then i am happy too. Excellent school and staff. The receptionist is a beautiful person. The staff always attentive and caring. BMIA is the best school in South Florida. Overall good experience. The teacher for my daughter's class is very warm and open to answer any questions and concerns that I may have. Love the diversity! My daughter loves it here!!! Great caring teachers and a clean comfortable environment, with lots of exciting activities daily. My son had been at Bright Minds (Tamarac) from 18 months to 3 years old. The teachers and staff are welcoming, always a smiling face. With their curriculum and activities, the children love it. My son has grown so much, we love this school. I am glad I made the right choice by choosing Bright Minds for my child. Miss Ivon, Miss Yelimar, Miss Rebecca, Miss Maria, Miss Danielle, have all been an inspiration to my son, and I am grateful to them all. Miss Anna (Director), your wisdom is endless and I appreciate you. Thank you Bright Minds for paving the way for my baby. Luv you all! We love, love, love this school, our baby is loved and cared for by all the staff. The educational activities are well-rounded and tailored for their age. I recommend this school to any parent. Our son has been going to Bright Minds International Academy for one year. He started on his first birthday. We were hesitant about having him start school at such a young age, but after touring almost a dozen preschools we couldn't be happier with our decision. The school is an amazing experience and our son has learned so much during his time here. The school offers extra curricular activities such as music class and in house field trips. The curriculum is fantastic and his class is always learning about countries around the world, artists, etc. If you are looking for an experience like no other, this is the place to be. It is not a daycare but an actual school experience. I find the school great. The Pre-K 5 teacher is amazing and the staff is very understanding and answer all my questions and concerns appropriately. I absolutely love Bright Minds! My child has flourished as a young learner and is more than ready for kindergarten. At 20 months old, finding a school that you trust to care for and teach your child is one of the most worrisome decisions. But I am so grateful I found Bright Minds, it was clearly the best choice I could have made for my child. Looking forward to seeing her excitement for learning continue to grow! hello i want to take this time to write few words regarding my experience since my daughter has been attended here at Bright Minds.i AM PLEASE for everything. I am glad i choose Bright Minds.i look forward for the next school year.thank you to all the teachers for all their great works.you guys won't regret all the things that you guys are doing for these great children.GOD BLESS YOU ALL. I want to share with you that I absolutely LOVE Bright Minds My older son started coming at 18 months, being a first time mom I was nervous, scared worried. Well you can imagine thinking if I was doing the right thing was this the right place. The first days I am going to admit it was hard leaving him here to the point that I would have my husband drop Diego off in the morning. After a few days I could see the difference in my son. He was interacting with everyone and enjoying himself, being the teachers helper. Most of all when I would pick him up he was excited to show me all the things he had done and learned about through out the day. I could see that he was maturing and becoming independent. 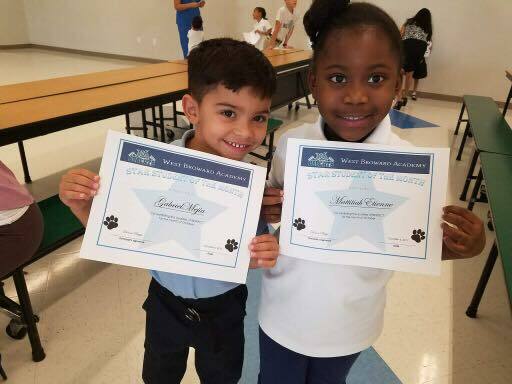 When I found out I was expecting again and it became time for my baby to start school, I did not hesitate in where I wanted both of my boys to attend. I am very happy happy here the entire staff is very friendly, approachable, and I can see that they are there for the children first and foremost. When ever I have had a question or concerned they have always been very respective. My boys Diego is now 3 1/2 yrs and Fabian is 16 months and they are both loving and learning every minute they are here. I have and will continue to recommend this school to everyone. I loved my experience here. My child was treated like a son and nurtured according to his needs. The staff is professional and educated to deal with young children. I would recommend this school to any parent who considers child care outside of their home. My two daughters have been enrolled for 1 month at this facility and my wife and myself are very satisfy overall with the program, school and the very patience and professional staff, including teachers and staff personal. We have a lot expectation about our daughters progress though the rest of the year. I'm very happy with the school. My daughter is very happy too and that is very important to me. I like that everybody here work with and try to accommodate my needs. I am very thankful for your hard work and for all the time given to my daughter Miley. I appreciate all of you very much!!! I love this school. My son has learned so much and I have noticed that he is more advanced than some children who dont attend school his age. The school has a family atmosphere which make me feel comfortable bringing him here. I love Bright Minds but the staff understand that my son needs more helps that they could not afford to give him even they will lose one child but their priority is for Jeremiah to get the proper helps that he deserved which they were unable to give him. So I decided to reach out for help, now my son has been accepted at ARC Broward Disability school and I am very happy thanks to Bright Minds. Gracias por ser tan especial y por todo tu lindo trabajo. Thank you for your amazing job. Thank you for inspiring children and co-workers. Thank you for aiming always to excellence! Las palabras nunca podrán expresarte lo agradecidos que estamos contigo por todo lo especial que fuiste con Sophie Maia. Tu eres ese angelito que Dios envió para que cuidara a todos nuestros hijos, y el amor con que lo haces se ve reflejado en lo mucho que ellos te quieren y en todo lo que aprenden de ti. Gracias por hacer tu labor con tanto gusto y por regalarnos a todos los que te conocemos tantas enseñanzas para poder guiar a nuestros pequeños. Que Dios te siga bendiciendo en tu camino y que sigas tocando muchas vidas más, así como tocaste la nuestra. Voy a expresar mi experiencia en espanol porque es mi primera lengua y una de las cosas q mas me gusto de este colegio fue ver todas las profesoras y todo el staff son hispanas lo q hacen de mi una experiencia inolvidable como mama tener a mi hijo en un colegio bilingue y con lindas y especiales profeosras cuinando y ensenandole tantas cosasd lindas a mi francesco, su cambio ha sido positivo en un 100% , francesco ha aprendido a ser independiente y a dejar q mami y papi tengan un free time mientras francesco esta pasandola rico, aprendiendo y compartiendo con otros ninos de su edad. gracias a mis daniel francesco teacher por ser la guia para poder educar a francesco de buenas manera y por ayudarme en este nuevo cambio para francesco..... recomiendo este school 100% para los papas q estan buscando el mejor sitio educativo y seguro para sus hijos!!!! Thank you, Ms. Silvana so much for being so sweet to my child. Kyla really enjoys going to school and she really loves you and her friends. She doesn't want to stay home because all the activities that you offer and the patience you have with the kids. She talks about the good times and the bad, like when she gets in thinking time when she did something that she is not supposed to, she says that you talk to her and she understand when she did something wrong. We are sad that Kyla is moving to another class and getting a new teacher, we want you to go to the next class with all the kids. We appreciate your love, patience and wisdom you share with the kids. We will miss you as her teacher, but we will keep in touch and swing by your class to say hi. Kyla has learned so much in your class and it's all because of you. Thanks so much again for being so sweet and nice. I love this school, is wonderful and have the BEST curriculum!!!! They use tecniques of Harvard in preschoolers!! It's amazing! Estoy feliz, mi hija tiene 2 1/2 anos y esta super contenta. El Curriculum es tan completo y todas las acxtividades son divertidas y muy educativas. Es el mejor colegio de la zona. Read the reviews at Google Places and rate our school. Read the comments at Facebook and rate our school.